Description Photo is a photocopy of a newspaper clipping. Newspaper caption: Margaret Bruce has identified many of the youngsters in this 1923 photo which appeared in the last issue of The Review: Top row, left to right: Price Burlingame, Gordon Bruce, Peter Owen, Robert Bodenstead, Unknown, Albert McLean, Catherine Baker, Francis Rose, Darwin Darymple(?). Middle row: Unknown, Ruth Primm, Claude Perrigo, Eileen Schaubel, Jack Curtis, Unknown, Richard Hughes. Bottom Row: Dorothy Hill, Lee Smith, Dorothy Brandt, Yvonne Davidson, Ted Farmer, Unknown. 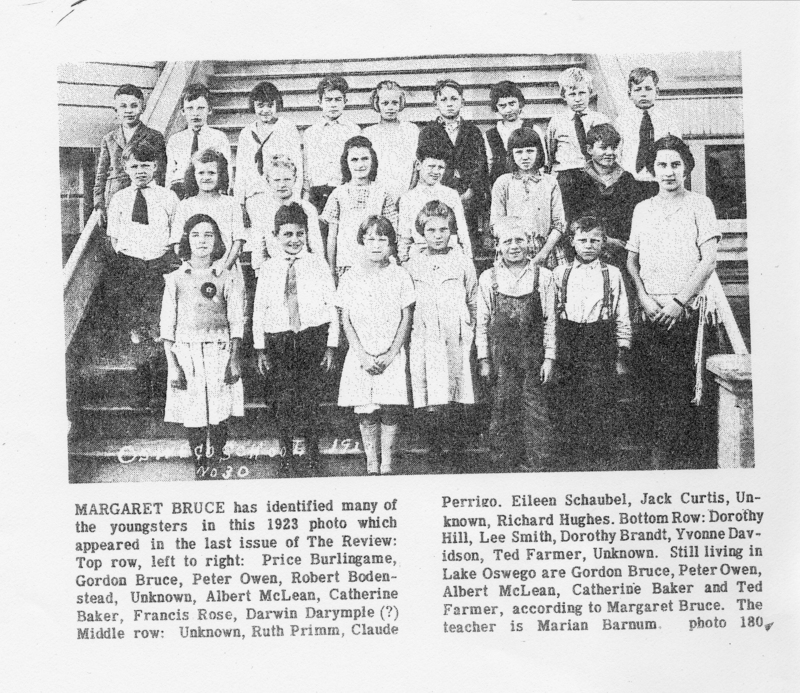 Still living in Lake Oswego are Gordon Bruce, Peter Owen, Albert McLean, Catherine Baker and Ted Farmer, according to Margaret Bruce. The teacher is Marian Barnum. photo 180. Physical Description H 11" x W 8.5"